A profitable solution and easy, to obtain hot water for free: with a simple installation, 100% of the hot water consumption of a home, even in winter, can be obtained, saving energy and money. In Soliclima, only the best international products are used. Our solar energy products are the best of the european market. Our experience of ten years and the satisfaction of our clientes are our garantee. The most simple and economic way of getting a profit of solar energy is producing solar hot water. 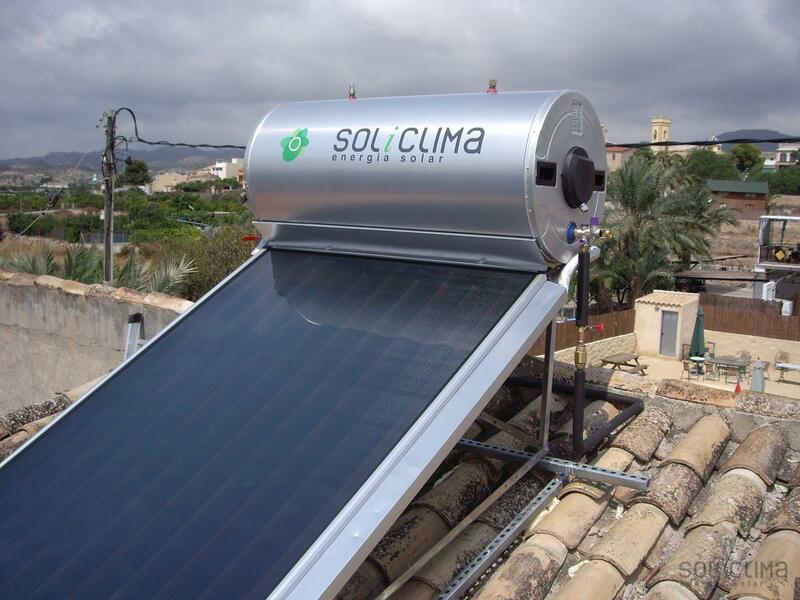 A solar hot water system is made of a group of solar collectors, a water deposit and an hydraulic pump. Solar panels can be installed in different places: on the roof or on a terrace. Even in the garden. Primary circuit absorbs the heat got in the solar panels, and this is transported to the water deposit, where ot is transmitted to the water we will use al home. Thouse days where solar energy cannot heat the water up to the temperature we need, an auxiliar heating group is applied, generally a gas o diesel boiler. the whole process works under the control of an electronic central device called solar control, that automates and coordinates the circulation of hydraulic circuits, the right temperature, security and other issues. The easiest and cheaper solar system for hot water is this solar heater, called thermosyphon, where everything works mechanical and automatically, so no electricity is needed. Water deposit is installed together with the solar collector, on the roof. Maintenance is also very easy. Soliclima offers a technical support of big quality thanks to its long experience of more of 10 years in solar energy. Solar water heaters unify deposit and solar collector, sending hot water directly to the dwelling without the need of an installation inside the house. Thermosiphon is a mechanical solution for the generation of solar hot water, without the need of installing big accumulators in engine rooms. They don't need even electricity to work, because there are neither solar control -facility is autoregulated on a mechanical way- nor hydraulic pumps. This is the more simple and economical solution althought is also the most limitated.